Israeli Prime Minister Netanyahu has been questioned in some four cases, mainly of corruption but possibly also bribery. Even so, his popularity remains unchanged in 2018. Each case has a number (1,000, 2,000 etc. ), and as these have accumulated, they have dominated the Israeli news. Each day, new details are emerging, along with another Netanyahu associate turning state’s witness. The third such person, Netanyahu’s media advisor Nir Hefetz, who turned state’s witness while Netanyahu was meeting US President Donald Trump in Washington in March 2018, was quite close professionally and personally to both the prime minister and his wife, Sarah. She too has been brought in for questioning and is likely to be charged if the State Prosecutor accepts the police investigators’ recommendations to bring criminal charges. The charges themselves concern hundreds of thousands of dollars’ worth of gifts (cigars, champagne, jewellery, family holidays and more) bestowed upon Netanyahu – while in office – by wealthy individuals abroad. Charges, if brought, will focus on favours or efforts Netanyahu provided in exchange to these ‘friends’. These possible bribery charges may also be linked to some of the additional charges relating to manipulation of media outlets to obtain favourable coverage, the Ministry of Communications (of which Netanyahu is acting minister), regulatory changes beneficial to associates and more. Moreover, there is a relatively new potential case of obstruction of justice: that is, a rumoured offer of a prestigious position to a female judge in exchange for closing a case against Sara (in connection with household expenditures and private Netanyahu residences). Finally, many believe that still another case might ultimately be linked to Netanyahu: financial dealings surrounding the purchase of German submarines through an intermediary known to be an Netanyahu associate. In all these cases, the public has been subjected to daily details and updates. Corruption, even in high office, is nothing new in Israel. Ehud Olmert, former prime minister, has only recently been released from prison after serving time for bribery while in office. Aryeh Deri, the present interior minister, also served time for corruption when he was in the same ministerial position some years ago. Indeed, corruption was one of the factors that brought down the Labour government in 1977 and the right-wing Likud government in 1992 (paving the way for the election of Yitzhak Rabin and the opening of peace efforts with the Palestine Liberation Organization). More to the point, both Ariel Sharon and Netanyahu himself, during his first term as prime minister in the 1990s, were suspected of corruption although charges were never brought against them. It was, and is, necessary to have a pretty solid case before the police will recommend bringing charges against a sitting prime minister. This is what makes the police’s present recommendations so compelling. Nonetheless, it remains to be seen whether the attorney general, originally appointed by Netanyahu and considered at the time to be his associate, will indeed bring charges and put Netanyahu and his wife on trial. This is the question. Netanyahu has consistently denied any wrong-doing, repeating the mantra that there will be nothing because there was nothing. In addition, he has criticized the police chief (whom he also appointed), along with the police investigators and, in Trump-style, the media. He has pointed to the many times in the past that the police have recommended trial only to have the cases dropped. He and his supporters have argued that the investigations are merely an effort by the left to oust him from power since they were unable to defeat him at the ballot box. He also tried to encourage legislation that would protect a sitting prime minister from criminal charges and other proposals to protect himself, although such legislation would probably have been defeated in the courts. Yet such accusations and efforts have hardly been necessary. 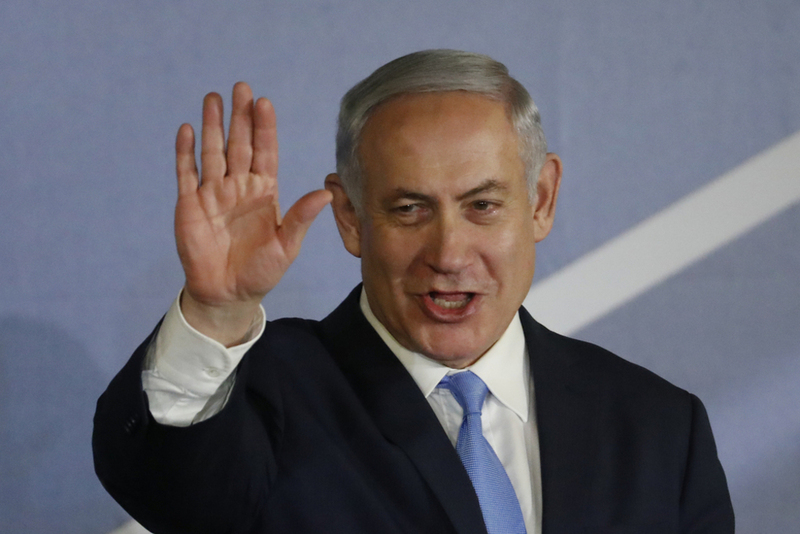 Both his party and the public remain solidly behind Netanyahu. People scoff at the matter of cigars and champagne, ignoring the enormous sums of money involved. They also mock the emergence of no less than three state’s witnesses from the prime minister’s inner circle, claiming that the need for so many merely proves that there really is no case. Recent polls indicate that the Likud party has not suffered from its leader’s apparently tarnished reputation; the party would, in fact, win more seats than in the last elections if a vote were taken today. Most Israelis, it would seem, like Netanyahu. The economy is stable, tourism is up, the occasional rocket from Gaza is merely a nuisance. If anything, according to Galia Golan, a leading Israeli political scientist, “tension on the border in the north is good for Netanyahu. The occasional terror attack, Palestinian violence or Iranian drone incursion not only divert attention from the accusations of corruption, they also strengthen the assumed need for a strong leader and a tough government.” They play into Netanyahu’s skillful manipulation of the public’s deep-seated fears, according to Golan. It is such manipulation that has helped Netanyahu and his party score electoral victories in the past, and all the signs suggest that this will continue. However, there is little appetite for elections among some of the parties in the coalition. Likud’s popularity notwithstanding, centrist party leader Yair Lapid, who is currently in the opposition, would be a formidable competitor to Netanyahu, and smaller coalition parties might also suffer. There does appear to be some jostling within Likud over a possible successor to Netanyahu, but the general impression is that Netanyahu would benefit from snap elections and Likud would go to such elections under his leadership. In any case, Netanyahu has said that he does not plan to resign even if the attorney general does bring charges. In early March 2018, there was a brief crisis and push for early elections. This occurred in a dispute over a bill concerning conscription (of ultra-Orthodox men) and the 2019 budget, a dispute in which the government coalition was divided. Netanyahu appeared to prefer early elections and may even have had a hand in engineering the crisis. His idea, apparently, was to have elections shortly after the 70th Independence Day celebrations and the opening of the American embassy in Jerusalem in May 2018, thereby bolstering his position before the attorney general’s decision. When it became clear that the Knesset (parliament) might only opt for elections in September, presumably well after a decision to indict Netanyahu, the crisis was rapidly resolved. Thus, the future of Netanyahu and his coalition remain a major question, although it appears unlikely that any of the four cases will end in indictment.